Harold Dermott, a former Jaguar Development engineer and Maurice Holt started their business, D & H Fibreglass Techniques Ltd, in 1975, working from an old mill premises at Greenfield near Oldham. Initially the company built the Mini Marcos having licensed the project from Jem Marsh. In 1977 freelance designer Richard Oakes was commissioned to design a more modern coupe and the Midas was born. Richard subsequently became a director of the company along with Harold’s brother, a marketing expert. Mark 1 – Midas Coupe. The first Midas appeared at the Performance Car Show in December 1978 and the first kits were delivered in August 1979. The Mk 1 is entirely Mini based and has front indicators below a one-piece bumper. The dash is also Mini based, while a few non-Mini items, such as, the Renault 14 door mirrors, the Fiat 126 windscreen and the TR7 rear lights and fuel cap, complete the styling The chassis numbers commenced with D10000. Some cars have been retro-fitted with the later ‘Steve Pearce’ design of nose cone / bumper assembly. Mark 2 – Gold, Silver, Bronze. Gordon Murray, then the Brabham F1 designer, chose the Midas as a basis of a car he wanted to build – this became the Midas-Alfa. Richard Oakes was already working on an upgrade that incorporated larger arches, to allow 13″ wheels to be fitted, and a new interior. Gordon Murray had suggested suggested some aerodynamic tweaks and these were also incorporated into the design and the Mk2 was introduced in 1981. The front indicators are set into split bumpers and the dash is a wrap-around design with a Mk1 Metro instrument binnacle. The Mk2 came in three different build standards: Gold, Silver and Bronze. The chassis numbers began with 20067, continuing from the last Mk1. After the Mark 3 Coupe was launched, the Mk2 continued to be sold as the Bronze until 1989. Wraparound bumpers, styled by Steve Pearce, were offered on later models. Mark 3 – Gold Coupe. The Mk 3 was first shown at Motorfair in London in 1985 and was called the Midas Gold. Styled by Richard Oakes, the car is entirely Austin Metro based and much rounder in appearance than the first two models. Chassis numbering complies with SMMT standards and is quite a long-winded affair, but end with 3011***. Like its predecessors the Mk 3 is very versatile, either as spacious 2 seat hatch-back coupe or true “2+2” – just so long as your back seat passengers are on the small side. Mark 3 – Gold Convertible. The Convertible was launched at the 1988 Motorshow following “development” work carried out by Steve Pearce using a chainsaw and plaster to come up with the stylish convertible. In truth, the development was a little more involved. While Steve Pearce took care of the styling, Midas Cars Ltd undertook a programme to develop a sandwich floor construction method to replace the stiffness lost by removing the roof. Chassis numbering follows the Mk 3 format. This model is a true convertible offering both a conventional soft-top and an easily removable hardtop. A truly cavernous boot makes the convertible even more practical and easy to live with. Following a disastrous fire at the Corby factory and a difficult financial climate Midas Cars Ltd went into liquidation in November 1989. Pastiche Cars Ltd were successful in bidding for the company and took control in February 1990. Pastiche continued production of the convertible; however, the kit specification was much reduced, increasing the amount of work on the part of the builder. Pastiche sold some ten convertibles before calling in the receivers at the start of 1991. There is no formal chassis numbering for the Pastiche models. After many rumours, GTM emerged as the new owners of the Midas marque. Following a re-launch at the Sandown Park Kit Car show in August 1991, the Gold convertible continued to be manufactured at the GTM factory in Sutton Bonnington, Leicestershire. GTM added the optional hardtop to add to the appeal of this practical little roadster. GTM Midas chassis numbers now end with 4011***. GTM sold the Mark 2 (Bronze coupe) to Midtec Sports Cars and the Mark 3 Gold Coupe model was sold to Berlin. The Bronze moulds disappeared when Midtec closed, but the Gold moulds were recently re-discovered and are now in the possession of the Alternative Cars Ltd.
2 + 2 Coupe – Cortez. April 1995 saw the introduction of a new Midas, the Coupe 2+2. Again Richard Oakes continued his association with Midas collaborating in the design of the new model. 2 + 2 Convertible – Excelsior. This model was unveiled at the 2001 Donnington Kit Car Show, and features an integral soft-top that is fully concealed under a special cover in the rear scuttle. It combines all the refinements of the donor Rover 100 with the poise of the Cortez into a sporting, but practical Convertible. The Excelsior was developed by GTM when they sold the marque to the short lived Midas Cars Ltd of Redditch (2001 to 2003). Alternative Cars Ltd was formed to rescue Midas Cars. A successful bid was made for the assets of Midas Cars Ltd and in early 2004, Alternative Cars Ltd set up a new workshop at Little Clanfield Mill, in Oxfordshire. 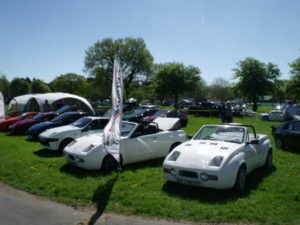 Midas Sports Cars were re-launched at the National Kit Car Show at Stoneleigh in May 2004 and initially concentrated on the 2+2 models: Cortez and Excelsior. In 2006 a new Midas Gold convertible was built incorporating some subtle improvements that made it IVA compliant and the finished car debuted at the Great Western Kit Car Show in Exeter. Following the downturn in 2008, Alternative Cars re-focused on rebuilding the older cars and supplying parts for all the Midas models. They can still supply brand new bodyshells for the Gold Coupe, Gold Convertible, Cortez and Excelsior and are now based at Enstone Airfield in North Oxfordshire.